Vacation rental house. 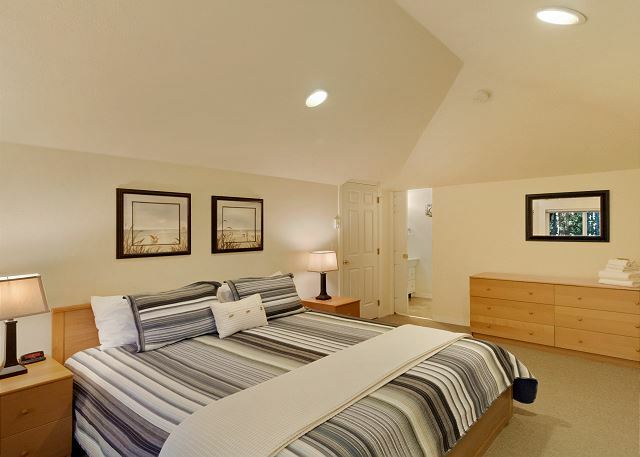 Sleeps 8, 3 bedrooms, 2.25 bathrooms. No pets allowed. Stretch your legs at Woodhaven. 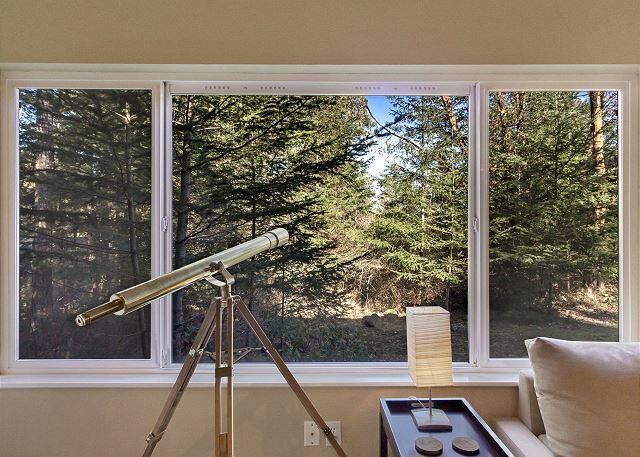 This spacious 3 bedroom, 2.5 bath home is located near Roche Harbor. 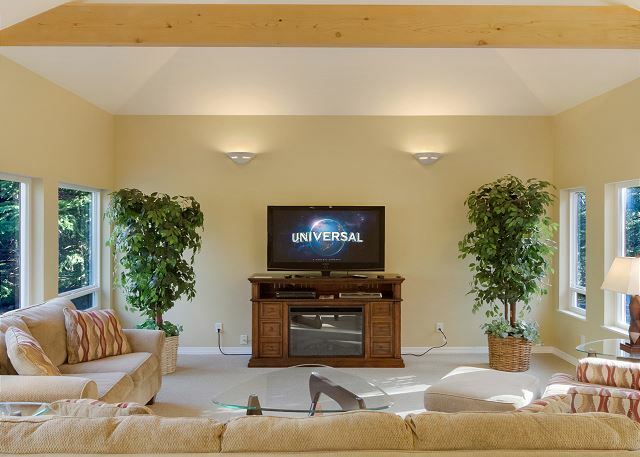 The living room is open and bright with lots of windows and vaulted ceiling. It is comfortably furnished with a large screen television for relaxing after a long day of sightseeing. 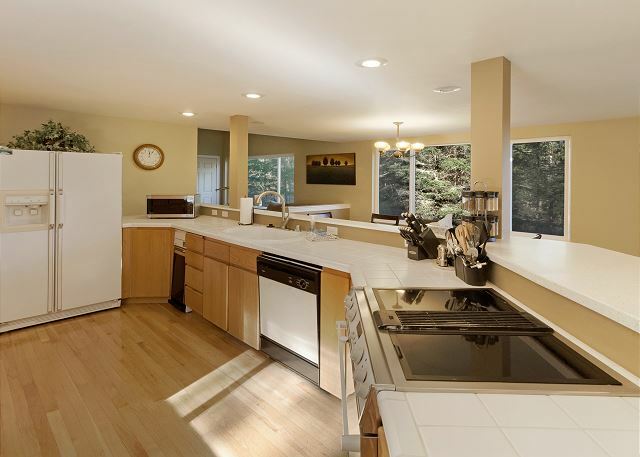 The fully equipped kitchen offers ample space for preparing meals and has bar seating. The dining area is furnished with a large table that offers seating for 6. 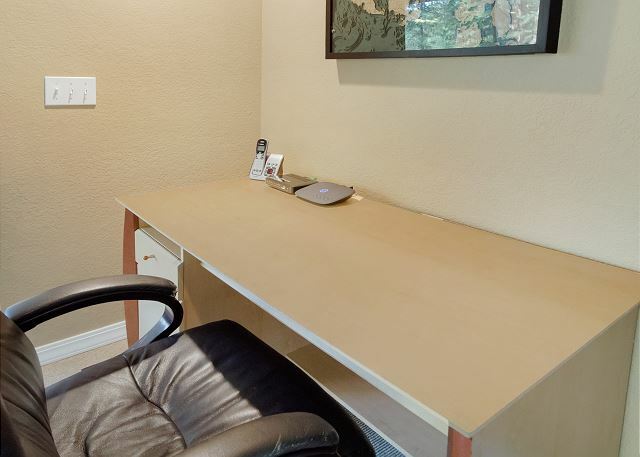 If you don't want to watch television or need to do some work on your trip, the family room offers a desk and love seat for reading or relaxing. Enjoy the outdoor air on the paver patio with BBQ and seating for 6. 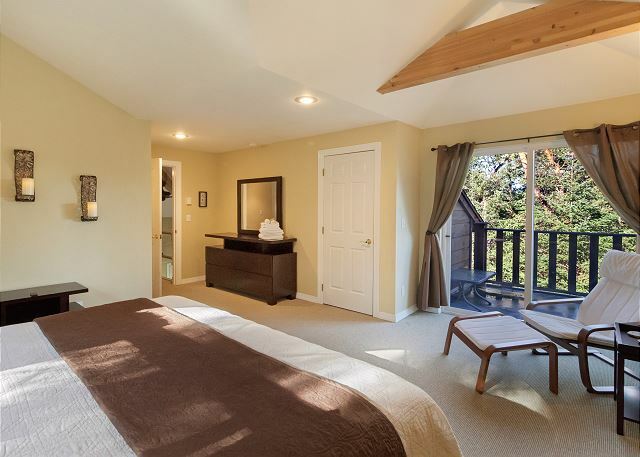 The upstairs master suite is furnished with a king bed and has a private deck. 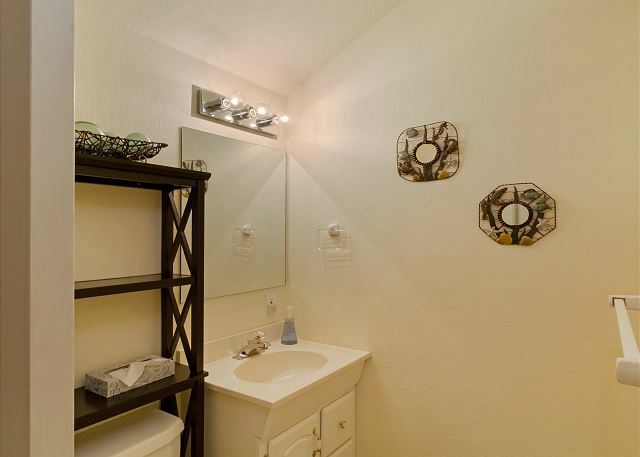 The master bath has dual sinks, a soaking tub, and shower. 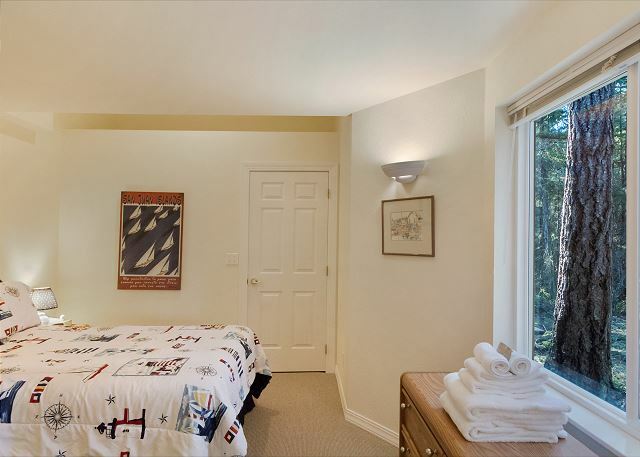 The second upstairs bedroom is furnished with a king bed and has an adjoining powder room. 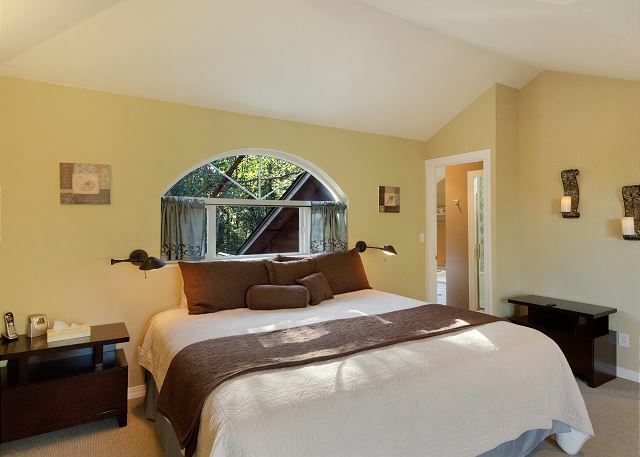 The third bedroom, main level bedroom is furnished with a full size bed. There is a full bathroom on the main level. 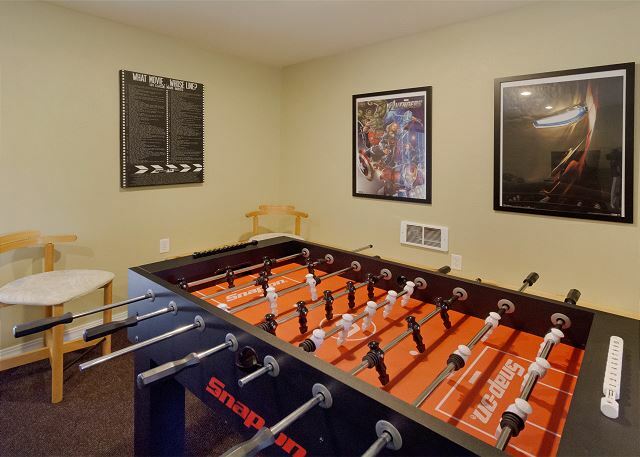 Have fun in the game room furnished with a large screen television for gaming, air hockey table and foosball table. This room also has a queen size sofa sleeper. There is a paver patio and French doors to keep you connected to the outdoors. Ride your bike into Roche Harbor Resort and use the amenities including the pool, playground or shop, dine, or have a day at the spa. Reuben Tarte Park is about 2 miles away, the Frisbee golf course is about 1 mile away and there are numerous, close by trails to explore. Had a great time, house was nice and cozy and slept are big group well. Would differently reccomend it to others.looking forward to booking it again on the next trip. Woodhaven is a really great spot for a large family to gather and relax, we are so happy to hear it suited your group so well! Thanks again for choosing San Juan Property Management, and we hope to host you at Woodhaven again in the future! This house was everything I was expecting. Very well stocked as well. The mgt. company followed up with us a few times to ensure our stay was going well. We love to have happy guests at the rental properties, and we are so happy to hear you all enjoyed your stay. Thanks for choosing to rent through San Juan Property Management, and we hope to host you at Woodhaven someday again soon! Enjoyed the beauty of San Juan Island in a relaxing environment. Of all the houses we have rented, this, by far, was the most beautiful, organized and immaculate. The architectural design was intriguing while creating sound attenuation, privacy and space. The neighborhood was ideal to venture for a walk or hike. Roche Harbor community was close by foot or auto. Truly a dream house where i didn't want to leave! Thank you for showcasing this home in your rentals. We will rent this one again! 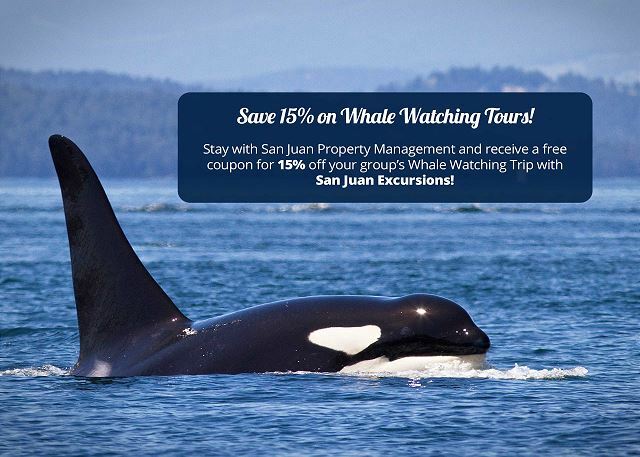 We are longtime visitors to the San Juans and this was our first visit to this property. Being so close to Roche Harbor for the 4th of July was fantastic and the house itself has everything you need for a short or long stay. The layout is great for families sharing, as we also brought our friends from Texas on their first SJI visit. Here we could also all have our space when we spread out and there was more than enough room for 2 cars in the driveway. The game room is conveniently located away from the living space, so that you don't disturb others with competitive play ;) The kitchen is large enough to have several people cooking at once and eating outside each night was a dream. Will definitely rent again when we share our vacation with other couples or family! We were very impressed with the state of the home and the quality of the beds/bedding. We've stayed in many homes where the beds and bedding, dishes, and games were thrown together like they were an afterthought, and were old, broken, or just missing....this was not the case at this home. Loved every minute of it!!! We had a lovely time, beds were comfortable, everything was very clean and comfortable. This house has lots of open space, so that even 8 people don't feel crowded. Big kitchen and nice game room separated from main house are bonuses. 1st floor bathroom also serves as hallway to game room -- a bit awkward. 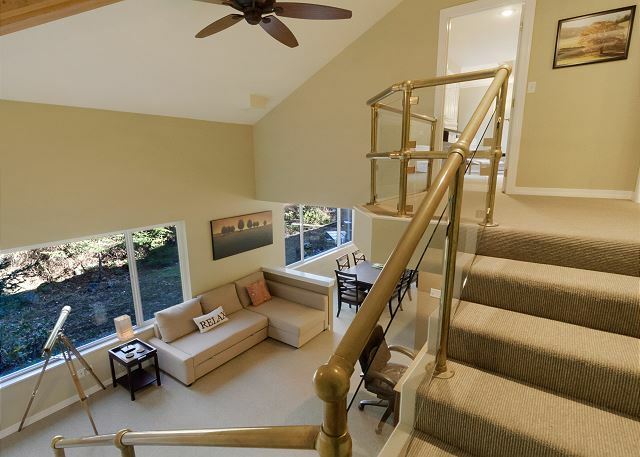 This home is close to Roche Harbor, especially by the back way! We had a wonderful vacation in this home. It was large and well equipped. The Home was very clean and in great condition for our arrival. Some of the appliances were a bit dated, but all in perfect working order. Great selection of movies, Wii games, and DishTV. The play room was awesome for our kids. Overall very happy! We stayed at Woodhaven over the Thanksgiving weekend. Great property! Big kitchen with everything we needed to cook the Thanksgiving dinner! Plenty of rooms/beds for all of us (husband and I, my mom and our two kids). Everyone enjoyed the game room. We especially loved the daily visits from the deer. We would definitely come back! Property Management company was wonderful during the process and left us a card and gift for when we arrived. We loved our stay at Woodhaven! The game room was awesome for kids and the house was spacious for all of us. The only thing i would change was that the TV's were not connected to the internet so we could not use any streaming services. It would have been nice to have access at night so the kids could watch a movie. Otherwise it was great, everything we needed was there! 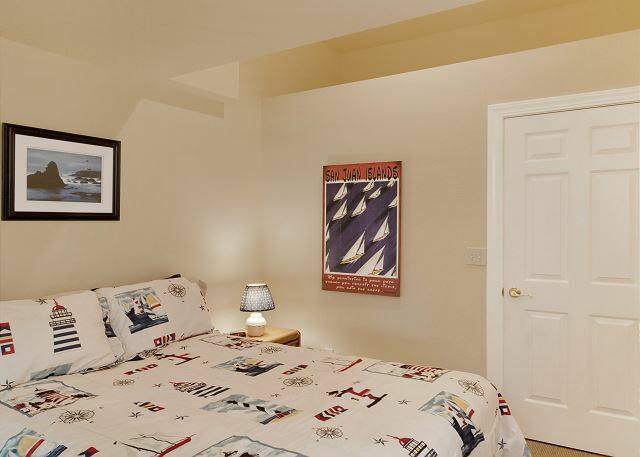 We enjoyed our 2 night stay at this nice clean cozy rental near Roche Harbor. 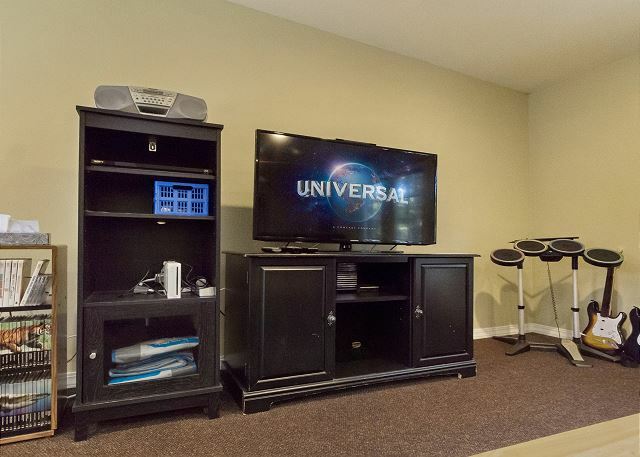 The game room was a great touch and a great deterrent for the kids to stay off their smart devices for a moment. There was a resident deer who would oh so casually move past the back yard, close to the patio, nibbling here and there both mornings and evenings. Perfect size for 4 adults and 3 kids. Would definitely rent it again. We are a group of two families with 8 persons total traveling together. We like this property very much. It meets our expectations. Sleep arrangements are comfortable. There is one extra mattress to use because the bed in the downstairs bedroom is only a full size bed and it is kind of small for two persons to sleep on. The extra mattress is good to use for that purpose. My son slept on it and he likes it. The two bedrooms upstairs are like two suites. The both are very large and convenient with two bathrooms attached to them. The pullout sofa bed is also quite comfortable. The kitchen is amazing and has everything we needed. Our kids liked the game room. Our parents liked to sit outside on the patio and enjoyed the fresh air. We saw deers every day outside the house. This house is like a heaven in the woods. Everything in the house is in good working order. We were so happy that we booked this house. I highly recommend it. This home was a lovely home away from home for my parents surprise 60th birthdays. perfect distance between Friday and Roache harbor. Plenty of games and entertainment in the home and in town! The home was clean and well kept. We had everything we needed and were very comfortable. Being close to Roche Harbor was a wonderful experience with the small store and wonderful seafood. Thank you so much. We arrived to an open sunny clean home. We appreciated all the extras, toys for grandchildren and a kitchen fully equipped, including extras like spices. We also enjoyed the nice outside eating area. This is our second time in 3 years at the Woodhaven. We love the place. The property was great for our group of 4 adults and 3 children (2 to 10). The game room was definitely appreciated. Lovely house. Table games for the kids. No window coverings on downstairs windows. The daily deer visits were our favorite part. This vacation home was the perfect getaway for my family of 6. We had one very rainy day so we made good use of the game room! The beds were very comfortable, the house was clean and equipped with everything you would need. We had deer come daily, easily visible through the large backyard windows. The area was very quiet and peaceful. This is a great place to get some R&R. My seven year old said "I'm going to miss this house" as we drove away, so hey - this one earns 5 stars in my book! 4 kids (ages 10-5) and 3 adults and we had plenty of room. The place was lovely and spacious. The game room was such a bonus w the kids a nite w/ air hockey, fooze ball and a wii! Everything we needed was there and the property managers were super helpful w island questions. We bbq'd one night and made fresh crab the next. Good home base to explore. My husband and I wanted to take our son and his family (who live in Seattle) for a long weekend getaway. There were 4 adults and 2 children, 7 and 5. This house was perfect! The layout was terrific, with places to gather as well as to separate. Great game room, lovely bedrooms and baths, wonderful kitchen. The house was very well equipped (except for a hair dryer). I would definitely recommend this house. Four of us rented Woodhaven...three cousins and the wife of one of the cousins. I am the youngest at 66, the oldest being 88, so we were a "senior" group. The house is great; we each were able to have our own bedroom, the living area was wonderful and we enjoyed the patio. Since we stayed for only a short time, we did not use the kitchen much for cooking, but I checked out what is provided and it is very well furnished for pretty much any kind of cooking one might want to do. We had a great time and I would consider bringing my children and grandchildren back for a longer stay. 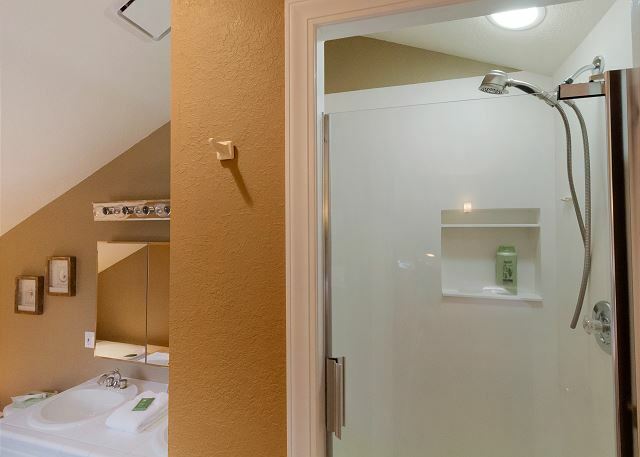 I will say that the master bathroom with the steps going down to the sinks and toilet from the shower level are a problem for older folks who might be getting up at night to use the toilet. Also, the driveway has two deep holes in it that were difficult to negotiate in our rental car. Aside from those last two comments, I will say this was a great rental. Thank you so much! We thoroughly enjoyed our stay at his vacation rental. The description was accurate and it was very clean. We met Chris, one of the property managers and he was very helpful. We would recommend this property and would stay ourselves, if we come back. We loved Maya's Legacy Whale Watch Tour, the whale museum, English and American Camp, Lavender Farm. The Cask and Schooner had great food. Two things that would improve our stay: Fix the concrete steps on back patio so that the pavers don't wobble (dangerous) and put some sort of hornet/wasp catcher up out back. We could not enjoy a meal outside because of these insects. Thanks. "Woodhaven" was a perfect rental house for our two families! Everything was very clean when we arrived. We were pleasantly surprised to get into the house early since we arrived earlier than expected! Our kids LOVED the "rec room". The air hockey and foosball tables were a huge hit! Thank you! We'll definitely recommend it to our friends and family! Great rental! Looking forward to a future stay here! Wonderful place to stay! The house was very clean and stocked with all our basic needs. We were able to view lots of wildlife from the backyard, eagles, deer, and an owl. Would definitely come back here again. Great Cozy place to stay in an atmosphere which makes you feel like living in a jungle. Saw 2-3 deers infront of the door, one with a new born fawn tagging along. Super proactive Management team. They called out to find out about the stay on the first day and provided additional items ta short notice. The perfect rental. 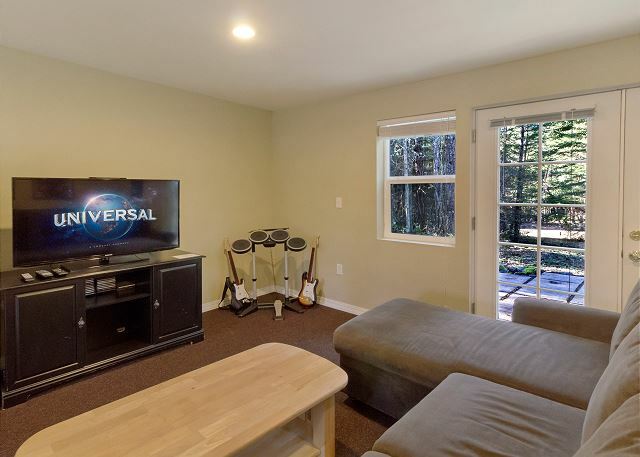 It's quiet, and private, with an open floor plan with lots of space and a converted garage (attached) that acts as a game room. We had so much fun! 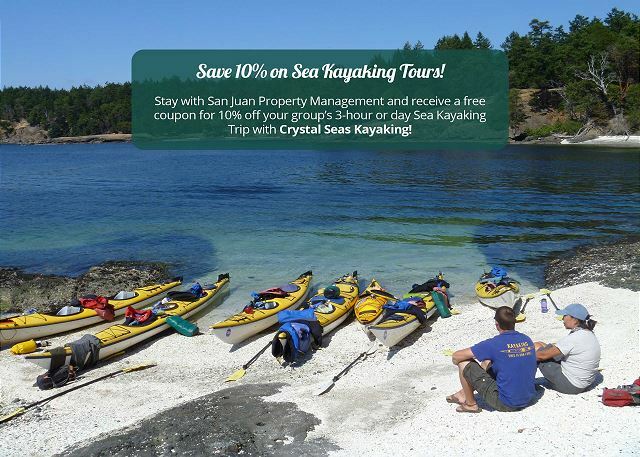 We had a wonderful time in the San Juan islands and loved staying in your home. It was nice to come back to after a day of exploring and to be able to cook a home cooked meal and have a game night with all the games in the bonus room. The bedrooms were very comfortable for a goodnights rest. We also loved being able to sit in the house in the mornings and watch all the deer in the backyard! We will definitely be back! Excited to have a quiet place to enjoy family - plenty of room for 7 adults. Enjoyed game room air hockey. 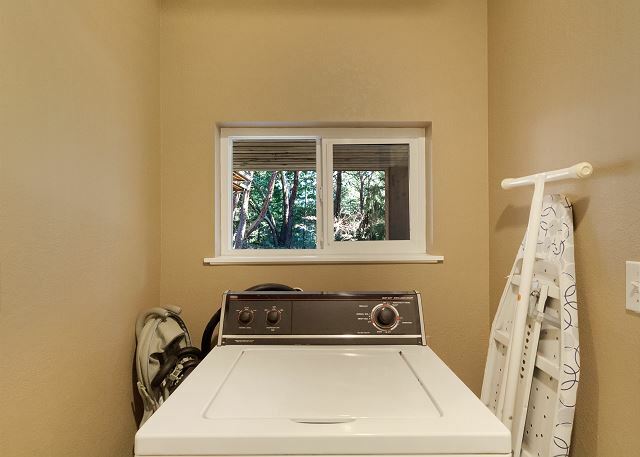 Agree with prior reviews regarding stove/oven needing upgrading. Was very spacious and open floor plan worked well for us! Wind storm seemed to cause Internet not to work and property management company continued to problem solve until the problem was resolved. Was so appreciated! We arrived to a clean, lit and warmed home on a dark and cold winter night. We found the home to have all the necessary kitchen items to make Thanksgiving dinner and the sheets and towels were soft and fresh. Every morning we were greeted by a few deer that seem to like snacking on the grass and shrubs that surround the completely isolated home. If you're looking for a place to relax and enjoy time with the people you're with, this is the perfect rental home! We definitely plan to return. The only downside was that the appliances in the kitchen are outdated and the stove was difficult to cook on since it's electric and there are only 2 burners. Other than that, everything was lovely! 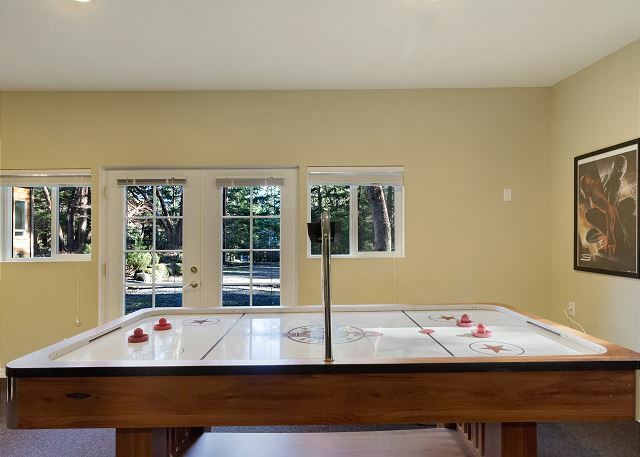 We had a great time at this house - the kids absolutely loved the game room with the air hockey and foosball table! We also enjoyed some of the movies they had at the house. The kitchen is large with plenty of counter space. The only complaint I have about the kitchen is that the appliances are old and could be replaced, in particular the fridge with an ice-maker and water dispenser that came with a new filter. The beds were comfortable and my favorite part was the soaker tub in the master bath. My only other complaint was that checkout was very early at 10:00 am. Even just one more hour would be more convenient, especially when timing the ferries that are in the middle of the day out of Friday Harbor. We stayed here during a trip to the island for a wedding and it was perfect. There's a super fun game room we didn't have enough time to properly enjoy and plenty of space to spread out and relax. There were 5 of us and there was more than enough room. Everything was nice and clean. The only thing I'd consider a minus was that the place smelled a little weird. Not really musty or dank or anything, it's probably just a result of being closed up for long stretches and it airs out pretty easily if it's warm enough to open the windows. In the evenings when it was colder I just burned a scented candle (very carefully! cause apparently it's against the rules) and it was fine. Maybe just adding a few reed diffusers or plug ins of some kind would fix it. Also, so many deer walked through the yards while we were there. It was beautiful. A really great house for families. Lots of games, plenty of space nice location. Woodhaven was an extremely spacious home. The pictures don't do it justice. It was clean, lots of fun toys/electronics for all ages and the kitchen was well stocked with utensils. We ate most of our meals on the lovely, private back patio. 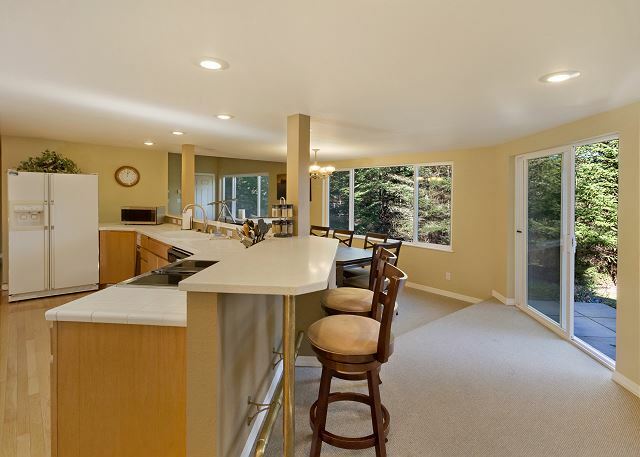 It's a very private setting but just minutes away from Roche Harbor. Stopping at closely located Westcott Bay is a must for fresh seafood to throw on the grill. I would absolutely recommend this property to friends. We'll be back! The house was spacious and clean and included all the basics. The location was in the middle of a wooded area. It was 15 minutes from Friday Harbor. The quietness, the chirping birds, and the daily deer visitors made one celebrate God's creation. 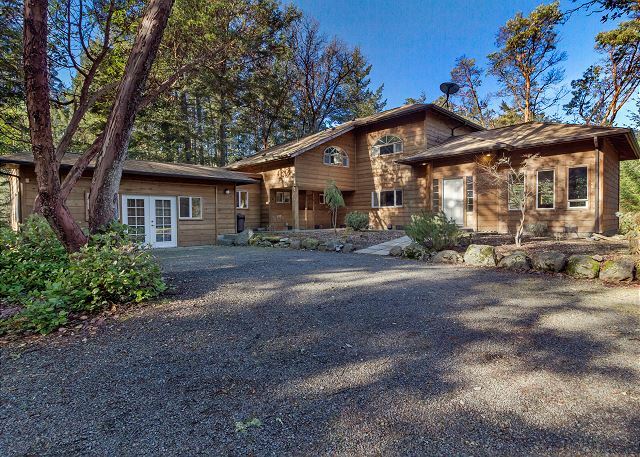 The home is a little far out from Friday Harbor, but it is worth it. Large home with all the amenities you may need. It is in a very quiet neighborhood. We saw several deer right in the yard. Wonderful family rental. The game room is perfect for all ages. 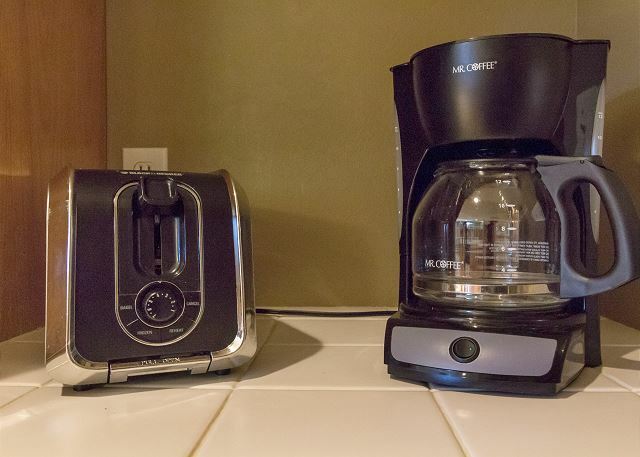 The home has everything a renter needs. Close to many attractions. We will be returning. Very pleasant experience with the management company. My family went to San Juan Island for my sisters wedding. We were very busy, so we had little time to relax & "vacation" in the home, but it was very comfortable for all of us to spread out & relax when we were in & out. The huge kitchen is easy for the whole family to hang out & cook together, and the game room has something for everyone/every age in the family. 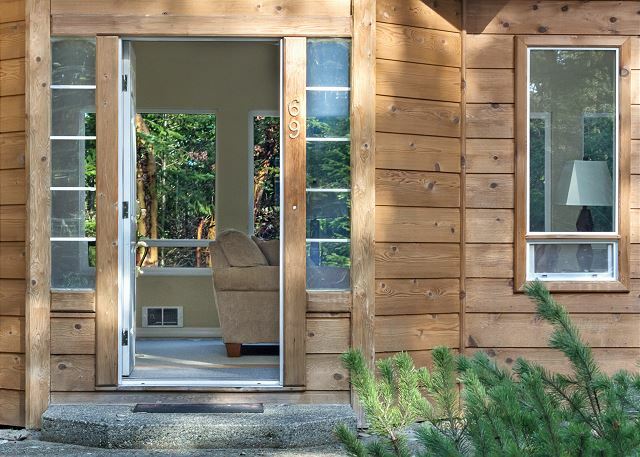 The home is just a few minutes from Roche Harbor, but about 20 minutes from Friday Harbor. There were not enough blankets for all the sleeper beds, so you may want to bring an extra one along & are no window treatments downstairs, so it's a bit awkward for those people sleeping on the sleeper sofas. 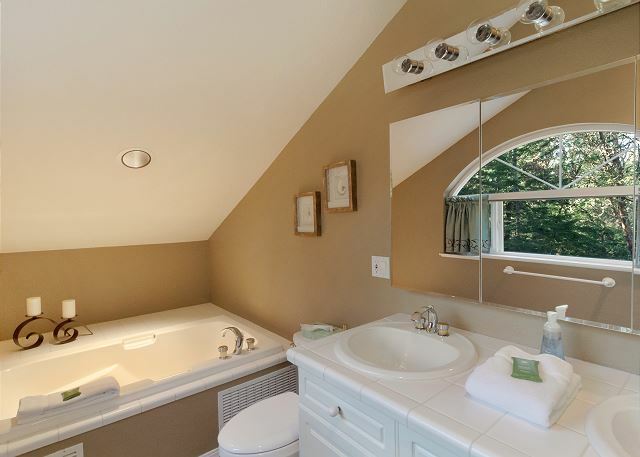 No curtains on the master bath, so you can't walk naked through the bathroom if someone is out in front of the house. Wi-Fi & cell reception spotty, so don't depend on getting any work done, just be prepared to be unplugged. My sister lives on the Island, so we visit frequently - we enjoyed the home & look forward to renting it again & again. 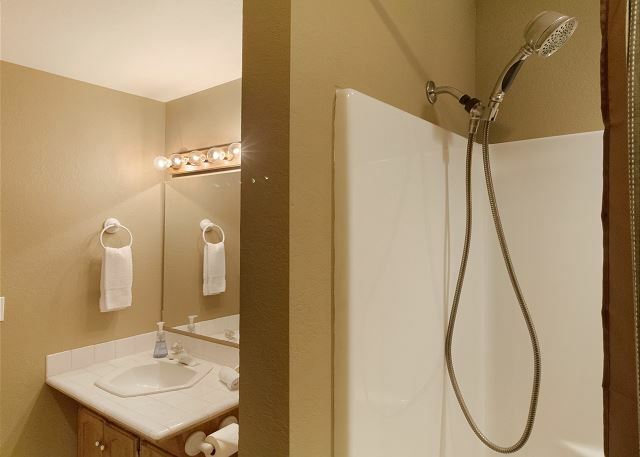 We found all aspects of the property perfect for our stay. I did notice that many windows were unlocked but we secured them before leaving. And, because, we appreciated the accomodations so much, we made sure that all beds were stripped and all towels and linens were washed. This vacation home is beautifully furnished, with a huge, updated and amazingly equipped kitchen. Seemed to be new paint and new everything throughout! Saw deer and fox from the large LR windows. Only caution: the sunken living room is tricky. The step down and back up, hard to see in dim light, caused two of our party to fall (nothing serious). 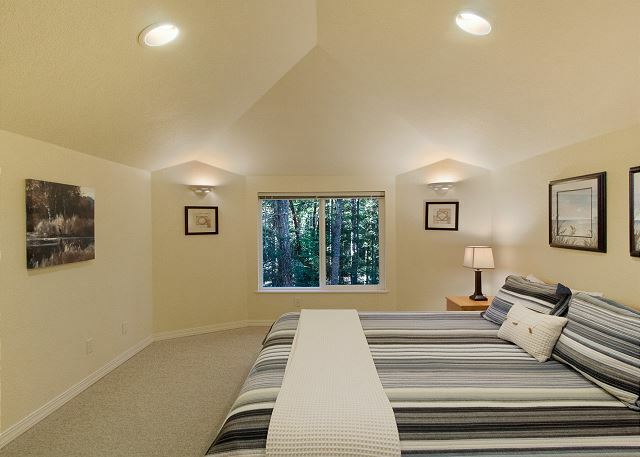 All rooms were spacious, esp the huge master suite (also with steps down into the master bathroom). You will need a car. Ten minutes to Roche Harbor and 15 to 20 minutes to Friday Harbor on winding, scenic roads. Enjoy! Wonderful house and a great location if you are interested in seclusion and quiet. We loved it. Home is nicely furnished and well equipped. Saw deer on the property several times. Nice area in back to grill using the propane BBQ. Location is a bit remote. Be careful of the steps down to and up from the sunken dining room and the steps in the master bathroom. San Juan Properties was attentive and responsive. Recommend Woodhaven very highly! We had a wonderful stay at the Sailor's Rest. 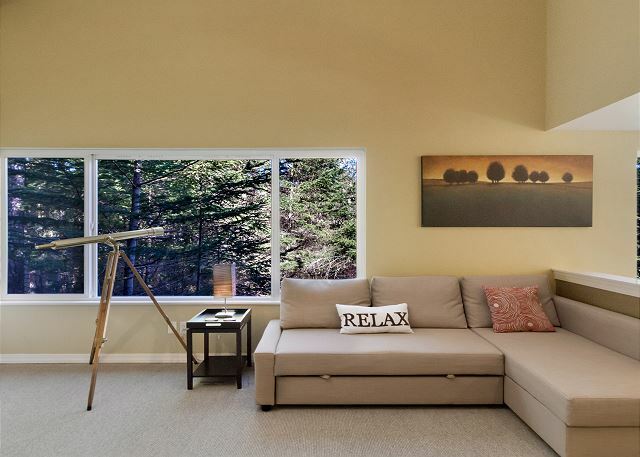 Very clean, quiet, serene ... exactly what one would want for a San Juan Island retreat. EVERYTHING WE NEEDED WAS PROVIDED, WITH THE EXCEPTION OF A DRESSER IN THE DOWNSTAIRS BEDROOM.PLEASED TO FIND SLEEPING PADS FOR 4 YR. OLD. WE WERE CONTACTED ABOUT MISSING EARINGS - NICE. We had a great trip and were able to easily bike into Roche Harbor. The location was quiet and relaxing. We had deer and foxes run though the backyard and felt very comfortable our entire stay! Sailors Rest was a nice home with plenty of room for a large family. It was immaculate snd well maintained. We recommend it.